Servant and Steward: Registration now open for TEC Encounter 2016! 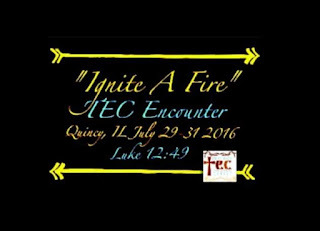 As I mentioned some months ago, Great River Teens Encounter Christ will host the International TEC Encounter 2016 this coming July 29-31 on the campus of Quincy University in my beloved hometown. Registration for Encounter 2016, with the theme, "Ignite A Fire," is now open. Encounter 2016 will begin at 5:00 p.m. on Friday, July 29th, and will conclude at 1:00 p.m. on Sunday, July 31st. If you are or have been involved in the Teens Encounter Christ movement and want to learn how to ignite a fire in your TEC center or in your own life of faith, please join us for this weekend of renewal. I made my registration to attend and hope you will, too!